In this article: This Blackberry Muffins Recipe combines blackberries with pumpkin and is topped with a sweet, crunchy streusel. It’s quick and easy to mix up ~ and delicious! Blackberry bushes grow like weeds where we live. At times, it feels like a fight to keep them out of the flower beds. 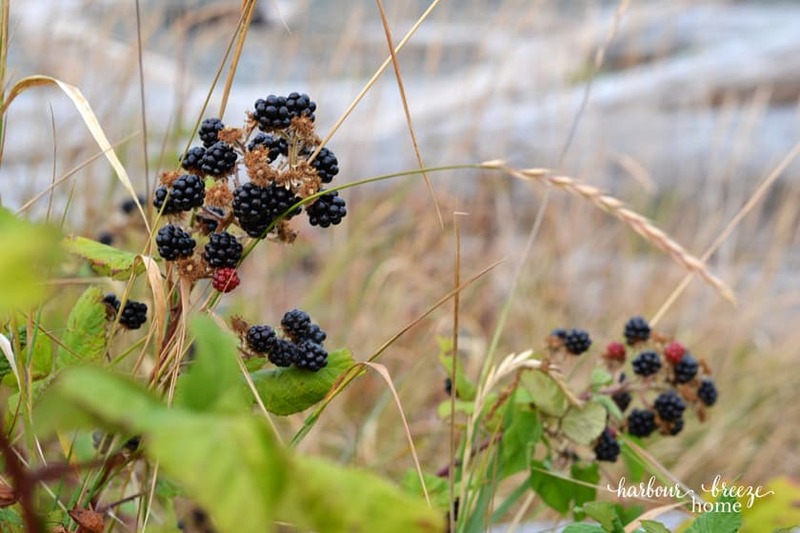 However, when blackberry season rolls around, it’s a wonderful thing! Blackberries’ sweet, juicy flavor make the challenge of picking them from their thorny branches worth-while. There’s a huge patch of them along the ocean path my husband & I walk on most evenings. We love watching locals and tourists with their buckets picking away. Since they are a berry you need to work hard to pick (and often quite high-priced! ), it’s nice to find recipes that are special to use them for. Along with my favorite blackberry jam recipe, these Blackberry Muffins Recipe is a special one, too. Mixed with pumpkin and topped with a sweet, crunchy streusel topping, they are beyond delicious ~ and simple to mix together. Here’s the recipe. Combine flour, sugar, spices, baking soda, and salt in a large bowl. In another bowl combine pumpkin, eggs, and oil. Add pumpkin mixture to flour mixture and stir well. Fold in blackberries. Streusel Topping: Combine 1/4 cup sugar, 2 Tbs. flour, and 1/2 tsp. cinnamon. Cut in 2 Tbs. butter with a pastry blender until crumbly. Sprinkle over the top of muffin batter. Bake at 350 degrees for 28-30 minutes or until a toothpick inserted in center comes out clean. When “pouring” this thick batter into muffin tins, try using an ice cream scoop or cookie scoop with a trigger (like these). It makes the job so much easier and quicker. 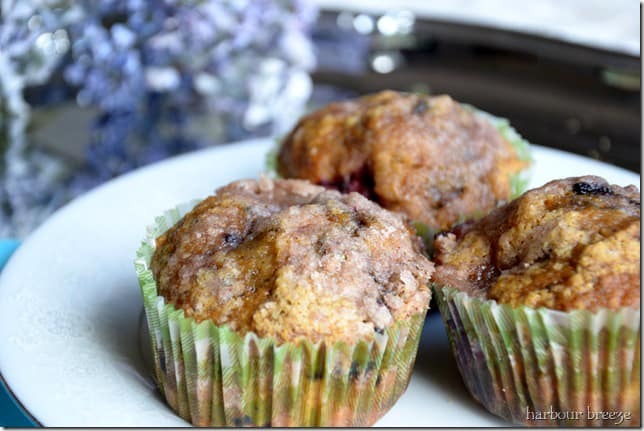 These blackberry muffins will make your house smell amazing as they bake! It will make a cold blustery day feel so much more cozy! Although it calls for blackberries, you can substitute any fresh or frozen berry. Blueberries are also very good in this muffin. If you want to have these as a treat for a Fall party or an appetizer, try baking them in mini muffin tins and topping with cute cupcake flags. Wondering what else to make with blackberries? Here’s a favorite recipe for jam ~ that doesn’t even require pectin! This easy recipe combines blackberries with pumpkin and is topped with a sweet, crunchy streusal topping. Combine first amount of flour, sugar, spice, baking soda, and salt in a large bowl. In another bowl, combine pumpkin, eggs, and oil. Add pumpkin mixture to flour mixture and stir well. Pour the batter into 24 paper-lined muffin cups so they are ¾ full. Mix together the streusel topping by combining ¼ cup sugar, 2 tablespoons flour, and ½ tsp. cinnamon. Cut in 2 Tablespoons butter with a pastry blender until crumbly. Distribute the topping evenly by sprinkling a bit over the top of each muffin. Bake at 350 degrees for 28-30 minutes or until a toothpick inserted in the center comes out clean. These are going to be on my list of recipes to try as my family has been feeling a bit neglected recently! Thanks! 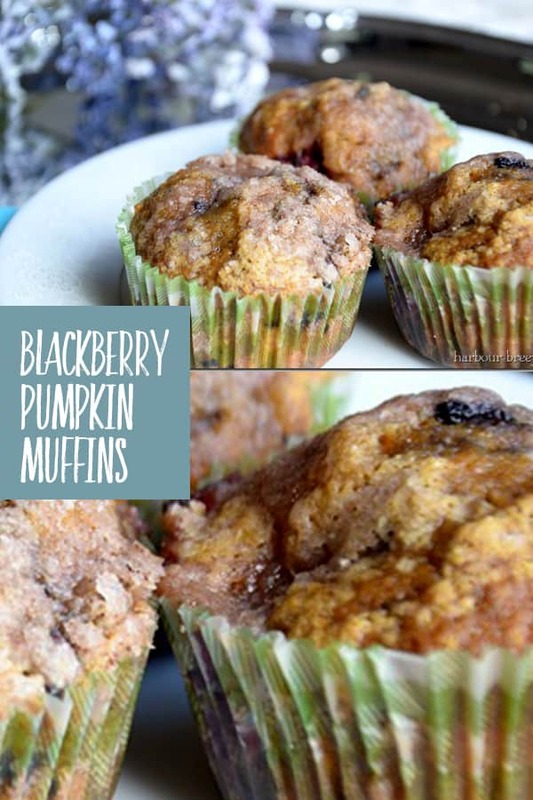 This look delicious, especially as I have frozen pumpkin puree AND blackberries in my freezer! Guess what I'll be making this weekend? OH I have to say thank you for posting this recipe!! You see I LOVE pumpkin but my family… not so much. Well I made these using the wild blueberries we brought down from Alaska (picked two years ago…) and my boys went wild!! I can't remember the last time I have seen them plow through a batch of muffins so quickly. So once again thank you! These are now on the list of family favorites! I just made these muffins for breakfast and oh boy are they yummy!! Such a treat! I wouldn't have thought of putting blackberry and pumpkin together, but I sure am glad that you did! This recipe is a keeper! These look delicious! That’s wonderful that you have blackberries growing around your home. I’ve never heard of this combo before but it sounds delicious! Thanks for sharing! Oh… just YUM! Just a wee bit jealous that these grow like weeds in your area! Pinned! Yum! These sound delicious! Will definitely give them a try. Oh, this look delicious. Love the photos. My granddaughter is coming to town. I think we’ll make these together. Wow Rita these sound amazing, I am going to have to give these a try. These looks delicious!! I will be baking some for breakfast this week! !